Introduce your kids to gardening with the Insect Lore Buzzby Bee Spray Nozzle. This bright yellow nozzle connects to any standard garden hose, and the plastic base has a comfortable grip for small hands. The 3.75" diameter foam head features Buzzby Bee's face for added interest. The water sprays from the center of the nozzle for easy spraying. The bold yellow color and Buzzby's presence make watering fun for any child. 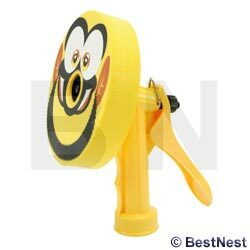 Teach your children to enjoy the outdoors with this Buzzby Bee Spray Nozzle.